Governance, religious assurance and Islamic banks: Do Shariah boards effectively serve? This study examines the quality of governance and religious assurance provided by Shariah boards (SBs) when undertaking the crucial compliance review required in fulfilling the expected ethical and social legitimacy of Islamic banks. To better understand the complex behavioural processes, we explore the governance role of SBs and assess issues related to competence, effectiveness and independence in the light of the newly adopted 2011 Malaysian Shariah Governance Framework (SGF). A series of semi-structured interviews were undertaken with key individuals in two well-established fully-fledged Malaysian Islamic banks. Our findings reveal that the newly implemented SGF has generally brought about some of the benefits hoped for by its regulatory architects. We find the quality of religious assurance to have been enhanced due to the emphasis placed on religious audit giving rise to improved credibility. However, we report the compliance review process to be inadequately undertaken with SBs still excessively reliant on internal officers implying possible independence compromise. We highlight concerns relating to (1) the general level of competency of individual SB members; (2) lack of technical banking and finance knowledge; and (3) SB members generally fulfilling a ceremonial role rather than undertaking vigilant monitoring. Our findings lead us to question the full impact of the new 2011 SGF and query the value and effectiveness of SBs. We make the call for the establishment of external religious auditors to render compliance assurance which could provide the much-needed impetus to improve governance and increase market and stakeholder confidence. In the last few decades, the Islamic finance industry has made rapid progress with total global financial assets currently estimated to be around USD2trillion with a compounded annual growth rate (CAGR) of 17.3% (MIFC 2014, p. 2). The success of Islamic finance is also evident through its contribution to corporate social responsibility (Farag et al. 2014; Abdelsalam et al. 2014; Platonova et al. 2016) and economic development (Gheeraert 2014; Gheeraert and Weill 2015). In relation to the growth of the industry, Malaysia was reported to be the third largest in the world after Iran and Saudi Arabia and contributed approximately 21.9% of the total domestic banking assets while also accounting for 9.6% of global Islamic banking at the end of 2014 (IFSB 2015, p. 9). In particular, the Malaysian Islamic banking industry is acknowledged to be the most developed globally with a comprehensive governance framework in existence for its Islamic banks (Aziz 2012; MGCC 2015; IMF 2017). As such, establishing sound governance practices in Islamic banks would instil confidence in stakeholders (Chapra and Ahmed 2002; Grais and Pellegrini 2006a; IFSB 2006; Ginena 2014; Ullah et al. 2016), improve credit ratings (Grassa 2015) and enhance stock exchange performance of this alternative banking industry (Polato et al. 2016). Despite their virtuous character, Shariah Boards (SBs) carry a heavy burden of responsibility for providing religious assurance which contributes to the robustness of the Islamic banking governance system as well as endorsing the religio-ethical legitimacy required by stakeholders (Bougatef 2015; Ullah et al. 2016). In addition, SBs are responsible for issuing an annual report on the religious compliance of the banks operations (Tomkins and Karim 1987; Karim 1990a, b; Maali et al. 2006; Ullah et al. 2016). It is, therefore, paramount that SBs demonstrate competence, independence and effectiveness as they play a key role in confirming to stakeholders of Islamic banks that an ethical system is in place allowing consumers to bank in accordance with their faith. However, previous studies have reported several concerns on the inherent deficiencies of SB role in relation to providing religious assurance (see for example Alhabshi and Bakar 2008; Rammal and Parker 2010; Hasan 2011; Hassan 2012; Ullah et al. 2016). Additionally, Hassan (2012) and Ullah et al. (2016) rightly allude to the lack of independence of SBs in delivering the crucial religious assurance since top management of Islamic banks were found to use several ‘overt’ and ‘covert’ practices to exert influence over decisions of SBs. In this study, we investigate the quality of religious assurance provided by SBs when performing the religious compliance review process in the light of the newly implemented 2011 Malaysian Shariah Governance Framework (SGF). We use the interview method and focus on two large well established fully-fledged Islamic banks to gather valuable insight, allowing us to explore in greater depth the role of SBs in fulfilling the central obligation of ethical and societal legitimacy. In this context, Cooper and Morgan (2008) note that case study approaches are especially useful in examining complex behavioral processes and addressing questions of how and why, whilst, Ahrens and Chapman (2006) highlight the potential for qualitative research to contribute to theory. By undertaking interviews with SB members and other key actors in the two selected Islamic banks, our study also directly contributes by responding to calls for qualitative research (see for example Spira 2002; Gendron and Bédard 2006; Turley and Zaman 2007; Beasley et al. 2009; Zaman and Sarens 2013; Everett et al. 2016) and presents the advantage of gathering more detailed information than typically is collected in quantitative research as mainly is the case for Islamic banking studies (see for example Alhabshi and Bakar 2008; Hasan 2011; Grassa 2015; Kanagaretnam et al. 2015; Mollah and Zaman 2015). To the best of our knowledge, a study focussing on the post 2011 implementation has not been previously undertaken and since Malaysia is a global leading player in Islamic finance, such a study would shed important light to prior literature and provide lessons for other Islamic jurisdictions. Our study also provides a theoretical contribution in relation to SBs role in ensuring religious compliance since there are several competing theories regarding corporate governance and the various organs of governance (see for example, Kalbers and Fogarty 1998; Cohen et al. 2002, 2007b). We examine the religious compliance role of SBs using three main governance theoretical foundations, i.e. agency theory, stakeholder theory and legitimacy theory. However, some studies propose that the agency structure is ill-suited to the operations of Islamic banks as its application can potentially result in a trade-off between compliance to the Shariah and the protection of investor’s rights (see for example Hasan 2009; Safieddine 2009). In particular, due to the wide spectrum of Islamic bank accountability, the Shariah broadens the concept of stakeholder interest and business legitimacy to include socio-religious compliance and ethics in the governance system of this alternative banking industry. In this research, we find that SB members, whose ultimate responsibility is to serve as agents to both shareholders and other stakeholders, were found not to be diligently performing their fiduciary duty of religious compliance as they remained heavily dependent on the outcome and results presented to them by internal officers thus compromising independence. Therefore, due to the conflict between current practice and theoretical exposition on the role of SBs, we suggest Islamic banks establish a clear line of separation in the responsibility of SBs by delegating the religious compliance role to an external auditor competent to undertake religious auditing whilst the SBs are to focus on their advisory role. In the next section, we present our literature review along with a discussion on the concept of Shariah, issues surrounding the supervisory role of SBs and the current framework for Shariah governance of Islamic banks in Malaysia and presents the study’s theoretical framework. In Sect. 3, we describe our research methodology and in Sect. 4, we provide analysis into the key features and functions of SB members and the extent of diligence applied when undertaking the all-important religious compliance review prior to providing their annual assurance report. Finally, Sect. 5 concludes the study by highlighting the salient issues surrounding this study. Islamic banks are established as ethical financial institutions with the fundamental requirement for their product and services to be wholly Shariah compliant. The concept of Islamic banking first emerged in the late 1940s but the pioneering effort in bringing Islamic banking principles into practice only became reality in 1963 with the development of the Mit Ghamer Savings Bank and the Nasser Social Bank in Egypt. However, the activities of these two banks were only attuned to collecting small savings and making direct investments in agricultural and industrial activities or to small local businesses and hence, were more akin to a social bank. In 1975, the Organisation of Islamic Cooperation (OIC) inaugurated an inter-governmental Islamic bank, known as the Islamic Development Bank (IDB), which was established with the sole purpose of fostering economic development and social progress among member countries and their Muslim communities in accordance with the Shariah laws. Now, there are over 300 Islamic banks offered across 75 countries and this market industry has grown 50 per cent faster than their conventional counterparts (The Banker 2015). According to the Islamic faith, the Shariah is regarded as a divine law that is derived from two main sources—i.e., the Quran and Prophetic traditions and sayings (otherwise known as Hadith). In the absence of clear guidance from these two main sources, the Shariah is also derived from secondary sources which include: ijtihad (legal reasoning), qiyas (analogical reasoning), istihsan (juristic preference), maslahah mursalah (unrestricted public interest), and ‘urf’ (customary practice). This provides justification for scholars to utilise the ijtihad facility to provide Shariah rulings (i.e., otherwise known as a Fatwa). The interpretation of a Fatwa or ‘religious ruling’ is provided only by religious scholars based on Islamic doctrine, the four main schools of thought are the Shafii, Hambali, Hanafi and Maliki Schools of Jurisprudence)1 with the ultimate aim of meeting the “objectives of Shariah”. The objectives of the Shariah were clarified by Islamic jurists such as Imam al-Ghazali amongst others as: faith; life; intellect; lineage; and, property (Kamali 2008) and was then applied in various contexts of a Muslims’ life including issues relating to human relations (mu’amalat). Other studies have concluded that the operations of Islamic banks promote the realisation of an Islamic financial system that is drawn from Islamic law (see for example Iqbal 1997; Zaher and Hassan 2001). Among others, Shariah law permits Islamic banks to operate business based on four principles: (1) risk-sharing or concept of equality; (2) materiality or economic value; (3) no exploitation whereby neither party nor the transaction should be exploited and (4), no financing of activities that are banned by the Quran (e.g., alcohol, pork products, etc.). Additionally, Shariah law forbids Islamic banks in business dealing with elements of riba (interest), gharar (speculative trading) and maysir (gambling) as such activities lead to the conditions that may facilitate economic exploitation and unlawful profit (Naughton and Naughton 2000; Lewis 2007; Hassan and Lewis 2007; Hossain 2009). When attention is turned to governance, there are various mechanisms in place to ensure that the integrity of the Islamic banking industry is upheld, including the appointment of competent SBs who are entrusted with the highest responsibility on aspects of religious compliance. Unlike their counterparts, assurance on religious compliance is unique to Islamic banks as it builds stakeholders confidence on religious legality of the products and services that banks provide. Several studies have, indeed, highlighted the key governance role of SBs in overseeing and monitoring the religious compliance aspect of Islamic banks (see for example Briston and El-Ashker 1986; Tomkins and Karim 1987; Karim 1990a, b; Banaga et al. 1994; Najeeb and Ibrahim 2014; Ginena 2014; Bougatef 2015; Almutairi and Quttainah 2017). These studies outline the duties of SBs in assuring that Islamic banking operations along with their products, contracts and management of Zakat comply with Islamic principles. Therefore, the issue of competency and independence of each SB are key governance features which demonstrate the reliability and soundness of SBs’ role in assuring ethical legitimacy.2 For this reason, members of SBs comprise of individuals who are experienced and qualified in various disciplines such as Islamic law, accounting, auditing and finance (see for example Gambling et al. 1993; AAOIFI 1997, para 7; Grais and Pellegrini 2006b; BNM 2011, p. 17; Ginena 2014) enabling them to competently manage and evaluate Islamic banking issues (Malik et al. 2011). Moreover, given that the requirement of SB independence is consistent with the current practice of external auditors, several studies have documented that auditor independence is associated positively with the effectiveness of audit committees in issuing quality audit reports (Bédard and Gendron 2010; Kueppers and Sullivan 2010; Jamal and Sunder 2011; Dobija 2015). After all, issuing a quality audit report also requires the external auditor to be competent and transparent in providing complete and truthful information to enhance understandability and reduce information asymmetry among investors (Graham et al. 2005; Barth and Schipper 2007; Billings and Capie 2009). However, since Islamic finance broadens the governance function of SBs into a wider spectrum of religious compliance, SBs are not only accountable to provide an independent and transparent religious report to stakeholders but also to ensure religious compliance of banking operations. By religious compliance we argue that SBs has the single most important authority to conduct regular reviews and monitor assessment to ensure that Islamic banks do not contravene religious principles governing its operations. When focussing on the issue of independence of SBs, several studies have claimed that the minimum supervision and monitoring role of SBs is due to lack of standardization in the governance of religious audit as well as a shortage of qualified and independent religious auditors in Islamic banks (see for example Garas and Pierce 2010; Najeeb and Ibrahim 2014; Othman and Ameer 2015). For instance, Rahman (2008) highlight that only a few Islamic banks undertake the crucial responsibility of reviewing and checking the transaction after the accomplishment of contracts and products noting that these could be due to a lack of regulation of the religious audit framework and the required expertise to perform this task. Other empirical studies have also been undertaken on matters surrounding the role of SBs. For instance, Ullah et al. (2016) applied grounded theory to key stakeholders of three Islamic banks in two different countries (i.e., Pakistan and the United Arab Emirates). The authors report that individual religious scholars as well as SBs tend to play only a limited role in safeguarding and promoting religious principles as management of Islamic banks attempt to avoid the supervision and audit role of SBs. In doing so, managers do not truly uphold religious principles, but merely aim to seek religious certification for their banking products. In fact, Ullah et al. (2016) highlighted that some Islamic banks engage in recruiting liberal scholars to attain permissibility of action especially when dealing with Islamic transactions or financial contracts. The concern was raised because managers may attempt to dictate to SBs’ decisions and opinions to tie up to their goal and objectives which is referred to by the authors as “Fatwa Shopping”. This could well amount to ‘managerial opportunism’. In an earlier study conducted by Garas (2012) on the key Islamic financial institutions (IFI) in the GCC countries, the researchers identified conflicts of interest in SBs and six specific independent variables: the SB executive position, SB remuneration, the relation between the SB members and board of directors (BOD) and the multiple memberships in Islamic funds, issuers of bonds and companies trading in capital markets. Garas (2012) asserts that a significant conflict of interest exists between executives and SB members, the membership in Islamic funds and the relation between the SB and the BOD. Furthermore, the study provides key evidence that the independence of SB should not be compromised if SB members do not hold any managerial position in the IFI and fixes SB remuneration. 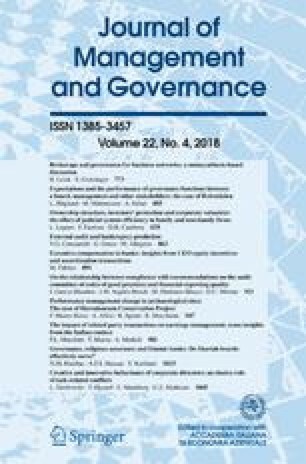 Discussion on the governance of SBs was also highlighted recently by researchers such as Mollah and Zaman (2015) who examined the effect of SBs and corporate governance on the performance of Islamic banks from 25 countries for the period 2005–2011. They claim that SBs provide a positive impact on performance of Islamic banks but there is still much need for further improvement in the effective oversight and monitoring role of SBs. In an earlier study, Alhabshi and Bakar (2008) conducted a survey to examine the prevalence of SBs of institutions offering Islamic financial services across several jurisdictions. The study highlighted that SBs have inherent deficiencies when fulfilling the religious compliance review role in relation to the development of Islamic financial products. Similar findings were further highlighted in a survey conducted by Hasan (2011) to examine the current governance practices of IFIs in Malaysia, UK and the GCC countries. The study revealed that SBs have minimum participation in conducting their review task as 58% of the SBs delegated their religious compliance review function to be carried out by the internal religious compliance unit. Additionally, Rammal and Parker (2010) conducted interviews to investigate the role of SBs in IFIs in Pakistan and their study highlighted grave concern on the credibility of SBs deliberating on Islamic banking issues and the limited pool of religious knowledge amongst the participants of Islamic banks that would then create a conflict of interest between SBs and management. Interestingly, Hassan (2012) conducted in-depth interviews with 46 key leaders in the Malaysian Islamic banking industry to identify the role, independence and the effectiveness of the religious compliance review of SBs. The study revealed that under the GPS-1 regime (discussed in the next section), Islamic banking operations in Malaysia experienced weaknesses in the quality of religious assurance provided by SBs as the religious compliance review function of SB was found to be mainly undertaken by internal officers and results presented to SB for approval. Hassan (2012) reported that SBs issued their religious assurance without proper due diligence as SBs were found to rely heavily on the result performed by internal officers with top management found to be over-ruling decisions of SB. Therefore, the arguments brought forward indicate that the quality of religious assurance could be improved with the adoption of the new 2011 Malaysian SGF framework which places substantial emphasis on the religious audit function to enhance the governance process and ultimately the credibility of SB, this is the subject of the next section. Malaysia is regarded as a leading country for promoting Islamic banking and finance and operates a dual-layer Shariah governance and regulatory framework. At the individual Islamic bank level, the governance of bank operations is supervised by an independent SB whereas supervision at the macro level is undertaken by the Shariah Advisory Council (SAC) of the Central Bank of Malaysia or Bank Negara Malaysia (BNM). It was discussed earlier in Sect. 1 that the governance system of Malaysian Islamic banking has experienced several stages of improvement. In 2005, the BNM, introduced the ‘Guidelines on the Governance of Shariah’ otherwise known as GPS-1. Following GPS-1, central requirements were imposed by the BNM which required Islamic banks to have SBs with a minimum of three members responsible to ensure that the business transactions are religious-compliant. GPS-1 also set the limit on membership of SBs to be not more than one bank with appointment of its members being subject to approval of BNM. To determine the extent of the authority of the central religious body, the SAC was authorised with mandated power on its governance role in the recent amendment to the Central Bank of Malaysia Act 2009 in which the resolutions issued by the SAC are binding on all Malaysian IFIs (BNM 2009). This Act repealed the earlier Central Bank of Malaysia Act 1958 which provided regulations for the licensing of the banking sector. In 2011, the BNM introduced its SGF aimed to enhance the role of the BODs, SBs and management alike in relation to the governance of Islamic banking operations. Since the implementation of SGF in 2011, the quality of religious assurance provided to the stakeholders by Islamic banks is expected to have been enhanced. This proposition is made on the basis that the new SGF places emphasis on the accountability of key organs of an Islamic bank in undertaking their governance function. The SGF further stipulates the minimum requirement for SB membership to be at least five with most members to have a religious educational background. The SB members are also required to be accountable and responsible for their decisions, views and opinions related to religious matters. In strengthening religious compliance and disclosure, the SGF also recommends for Islamic banks to establish Shariah audit and to develop an effective Shariah audit plan according to their particular business objectives, scope, personnel assignment, sampling, control, policies and procedures. Meanwhile, the management of Islamic banks are expected to provide accurate information about the business transactions and operations to the SBs. The SGF has also outlined the importance of religious compliance and religious research functions aimed at the attainment of a religious compliance-based operation environment in Islamic banks. Meanwhile, in June 2013, the Islamic Financial Services Act (IFSA) was introduced as an empowering mechanism to support the implementation of religious principles and an operational standard for IFI’s, including penalties in the case of non-compliance. Amongst issues highlighted relate to the appointment and qualifications of SB members and accountability of respected parties on the religious assurance of Islamic banking operations. For example, Section 30 of IFSA highlights the appointment and qualifications of SB members in IFIs. In this regard, under the new Act, banks may apply directly to the BNM on the establishment of their SBs to advise and oversee all operations, activities and affairs of the banks and to ensure that activities comply with Islamic law (BNM 2013, para 30). In relation to qualification of SB members, there is a provision for members to meet all standards and requirements that are specified by BNM and other international regulatory body that has significantly influenced the financial reporting of Malaysian Islamic banks including Accounting and Auditing Organization for Islamic Financial Institutions (AAOIFIs) and Islamic Financial Services Board (IFSB). For example, AAOIFI clearly spell out the role of SB’s as “the governance authority who are entrusted with the duty of directing, reviewing and supervising the activities of the IFIs in order to ensure that they are in compliance with Islamic Shariah rules and principles” (AAOIFI 1997, para 2). In a similar context, the IFSB recommended for the Islamic bank to establish an effective governance mechanism for obtaining and applying rulings from SB as well as on monitoring religious compliance aspects including the ex-ante and ex-post of financial transactions and the operations of Islamic Financial Services (IFSB 2006, para 47). To ensure the effective religious compliance procedure, SBs are required to have sufficient knowledge in Shariah as well as knowledge in law, accounting, economics, finance and audit (AAOIFI 1997, para 7; IFSB 2009, para 30; BNM 2011, p. 10). The mixed knowledge and background of SB members provides an effective SB composition on its commitment to ensure operations of Islamic banks are fully Shariah-compliant. As stated in the IFSA 2013, Islamic banks shall, at all times, ensure that business activities and transactions are religiously compliant. In the event of failure of Islamic banks to comply with the above provisions this shall make SB members liable to imprisonment for a term not exceeding 8 years or to a fine not exceeding twenty-five million ringgits or both (BNM 2013, para 29). More recently, the Guideline on Financial Reporting for Islamic Banking Institutions have been revised and became effective on 1 January 2014 to better facilitate users of financial statements to evaluate and assess the financial position and performance of Islamic banks. This new guideline, referred to as GP8-i, provide recommendations for the financial statement (i.e., statement of financial position, statement of comprehensive income) of Islamic banks to have separate disclosure and to be prepared in accordance with Malaysian financial reporting standards (MFRS). In meeting the provision of religious compliance stated in the SGF, this GP8-i also requires Islamic banks to disclose the SB report as part of the annual report and signed by not less than two SB members. As discussed in the introduction, corporate governance for financial institutions such as banks exhibit different features due to the opacity and regulatory nature of the industry (Ciancanelli and Gonzalez 2001; Andres and Vallelado 2008; Wilson et al. 2010; Mollah and Zaman 2015; Mollah et al. 2016). It is therefore important for financial institutions to be well regulated and for effective corporate governance to be implemented as such mechanisms are instrumental in promoting stability of the financial system as well as enhancing social welfare (Grais and Pellegrini 2006b). Similar arguments are deemed relevant when discussing Shariah governance in Islamic banks. Nevertheless, the distinguishing feature and portfolios of Islamic banks requires additional corporate governance mechanisms that ensure adherence to religious principles in their business operations and transactions. Hence, we examine the quality of religious assurance in Islamic banks using agency, stakeholder and legitimacy theoretical foundations.3 The agency theory is generally defined as the contractual relationship between the shareholder as the principal and the managers as the agent who are given authority to perform services on behalf of the principal (e.g., Jensen and Meckling 1976; Fama and Jensen 1983). However, the agency problem arises due to information asymmetry between shareholders and management (Agrawal and Knoeber 1996; Heath and Norman 2004). In such cases, it would provide management with scope to engage in self-dealing opportunistic behavior at the expense of shareholders (see for example Culpan and Trussel 2005; Djankov et al. 2008; Cline and Williamson 2016). Conversely, both the stakeholder and legitimacy theories postulate a much broader concept of corporate governance to be applied in organizations. The stakeholder theory provides greater latitude in widening the corporate governance concept as management not only acts in the interest of shareholders but also pursues interests of other stakeholders (Freeman 1994; Berry and Rondinelli 1998; DesJardins and McCall 2004; Letza et al. 2004; Solomon 2007; Collier 2008; Garcia-Torea et al. 2016). Meanwhile, the legitimacy theory can be translated into the way an organization commits itself to adopting corporate social behavior in its governance system to ensure compliance of values and norms of respective societies in which organizations operate (Suchman 1995; O’Donovan 2002; Deegan and Unerman 2006; Golant and Sillince 2007). The above arguments provide a claim that the integrity of the organization would be undermined if business operations are found to have less legitimate social behavior (Dowling and Pfeffer 1975). Interestingly, Deephouse and Carter (2005) elucidate that organizational legitimacy and organisational reputation are two concepts representing assessments of an organisation by a social system. Legitimacy also has influence on organisational theories such as institutional theory (see Meyer and Rowan 1977), resource dependence theory (Pfeffer and Salancik 1978) and organisational ecology (Carrol and Hannan 1989). However, it was the frequent appearance of this concept which prompted scholars such as Suchman (1995, p. 571) to observe that legitimacy is “an anchor-point of a vastly expanded theoretical apparatus addressing the normative and cognitive forces that constrain, construct, and empower organisational actors”. Thus, management has gained reputation in formulating various strategies to maintain the legitimacy of business operations leading to an enhancement of confidence in organisational stakeholders (Ashforth and Gibbs 1990; Patten 1992; Suchman 1995; Deegan et al. 2000; Phillips et al. 2004; Khan et al. 2013). In this paper, we maintain that from an Islamic banking perspective, legitimacy and reputation can be viewed as a concept that is complex and multi-dimensional and is linked to a variety of stakeholders having significance of being the ‘be all and end all’ of an Islamic bank’s survival. This is because without religious or ethical legitimacy, Islamic banks become meaningless as they require societal legitimacy to attract constituent support. Several studies have also highlighted that agency theory when applied in a conventional setting tends to limit the accountability of a bank’s operations to that of investors alone whereas the Islamic perspective broadens this to include moral integrity, an appropriate socio-political environment and religious compliance (Archer et al. 1998; Chapra and Ahmed 2002; Beekun and Badawi 2005; Safieddine 2009; Belal et al. 2015; Ullah et al. 2016; Almutairi and Quttainah 2017). The next section outlines the research methodology used. The aim of this study is to examine the effectiveness of the religious compliance review and the quality of the religious assurance process post 2011 Malaysian Shariah Governance Framework. We investigate issues related to competency, experience and independence of SBs and employ a qualitative approach using in-depth interviews to gather evidence. The use of in-depth interviews allowed us to discover interviewee ideas and perceptions and to ascertain specific factors that underpin their responses such as reason, feeling, opinion and beliefs (see for example; Lewis and Ritchie 2003, p. 143; Turner 2010). At the time of the study, there were 16 fully-fledged Islamic banks and 7 conventional banks offering Islamic windows in Malaysia. For this study, we selected two fully-fledged Islamic banks to meet our research design. We use a dual case study approach to expand the knowledge and experience in providing valuable insight of the phenomenon rather than averaging the effect across a number of cases (see for example; Kennedy 1979). Yin (2009) asserts that case studies allow researchers to find the characteristics of real life events such as individual life cycles, small group behaviour, organizational and managerial processes. Following Saeed and Izzeldin (2016) and My Phan et al. (2016), our sample selection of the case study is based on the level of profit efficiency determined by the reported net profit. Saeed and Izzeldin (2016) provided evidence that there is no trade-off between risk and efficiency in Islamic banks as their investment and financial products are based on a profit sharing paradigm unlike the interest based paradigm of conventional banks. In terms of bank efficiency, the two Islamic banks in our sample show relatively similar net profits for the financial year end 2015 indicating similar commitment of both Islamic banks in preserving the quality of their Shariah portfolio thus portraying robust governance mechanisms for assurance of religious compliance. Our use of in-depth interviews in the case study also has the benefit of providing a deeper consideration and not just surface understanding on the quality of religious assurance provided. Fortunately, our interview participants are the key actors with experience of both ‘pre’ and ‘post’ implementation of the new SGF in their institutions. This provided the opportunity of eliciting views directly from the people who had immense knowledge, experience and familiarity of the subject matter. We used several sources of information to frame our questions, including (a) our prior knowledge of role and function of SB members (b) previous academic literature (c) the professional literature (e.g. Central Bank regulations along with AAOIFI and IFSB guidelines on Governance). We pre-tested our research instrument on several academics and bankers to ensure that our questions were appropriate and there was no room for ambiguity. We modified several of our questions in the light of their feedback which was found to be invaluable. We undertook 14 interviews using semi-structured interview questions and details of our participants are shown in Table 1 below.4 Our participants are senior officials who are highly knowledgeable, have vast experience and who play a dominant role in their respective Islamic banks. To maintain anonymity, we identify the two Islamic banks participating in our study as Bank A and Bank B with interviewees comprising of SB members, Chief Executive Officers (CEOs), Heads of Religious Departments and Internal Auditors. Our interviews lasted approximately 90 min on average. We used a standardised checklist to guide our interviews and each interviewee was assured of confidentiality and anonymity. Given the specificity of many of the responses we received, we believe that our participants were truthful in their responses. Our interviews were undertaken between June and August 2015, almost 4 years after the implementation of the new SGF to allow us to obtain perceptions of its impact. We also observed how our participants responded to the questions raised. After obtaining the data from the interview sessions, we transcribed the data to attain general ideas of what the interviewees were responding to and to further reflect on its meaning before the data was encoded. Coding of the data is the process of managing the data into segments of text before being generated into information and serves as the formal representation of analytic thinking (Rossman and Rallis 1998, p. 171). Also, data coding is not just an analysis of data and data interpretation but allows researchers to axial code by identifying the link between the data to the idea and from the idea to all the data relating to that research (Richards and Morse 2007, p. 137). As in the work of earlier qualitative studies (see example Anderson-Gough et al. 2005; Jørgensen and Messner 2010), the codes in our study were derived from our research questions, theoretical framework and related literature. We then categorized the data and generated the themes based on the data coding. When analysing the data, we adopted thematic analysis suggested by Boyatzis (1998) which proved to have increased the traceability and assisted verification of the analysis. Hence, the process of developing codes, generating themes and analysis of the data were undertaken using Atlas.ti, which is a computer assisted qualitative data analysis software documented to have been widely used in accounting and management qualitative studies (see for example; Kend and Katselas 2013; Schäffer et al. 2015; Teixeira et al. 2016). This section presents the findings from our interview data on the effectiveness of the SB in providing religious assurance thereby endorsing the ethical legitimacy post implementation of the 2011 Malaysian SGF framework. It was highlighted earlier in Sect. 1 that both the stakeholder and legitimacy theories imply that SBs should be accountable in providing transparent and independent assurance to stakeholders in relation to religious compliance of Islamic banks. Therefore, the competency and capability of SB in issuing quality religious assurance should ensure a strong dynamic in the governance system of an Islamic bank and add value for stakeholders. Also, this study highlights some evidence on the current practice of SBs in performing their all-important religious advisory and compliance review role. Previously, our SB members only comprised of people from religious and legal backgrounds. Now, we (the bank) also search for SB members who have expertise in banking operations which is ideal. However, I am still satisfied if all SB members have strong knowledge in Islamic law to enable them to deliberate on religious matters. When appointing a SB, we try to maintain a balance and require a combination of experience and qualifications in the field of law, fiqh (jurisprudence), finance and accounting. The nomination of SBs would not only be selected by the BOD as the appointment is also subject to the approval of Bank Negara Malaysia (BNM). It is difficult for me to attest to the financial report because we (SB members) have a lack of understanding on the discussion of subject matters. We have to ask for assistance from bank officers to explain the issues pertaining to the operations of the Islamic bank. In a case when the bank deals with legal documentation, our SB members who possess strong knowledge in Islamic law along with our legal expert will actively provide advice on particular issues. The Bank had given their support and has full respect to the SB by allocating part of their financial budget for training and workshop of SB members. I think most Islamic banks including my Bank (i.e., Bank B) have initiatives with academic institutes to provide training courses for SB members. In the practice of Bank B, the respective management organised a familiarization session to provide specialist training. This is the only Islamic bank that provides knowledge for their management and customers directly by inviting the SB as a speaker in a conference. It can therefore be observed from the above discussion that the diversity in SB membership enhances integrity on the governance role of SBs in assuring the ethical-religious operations and identity of an Islamic bank. These findings are consistent with other empirical studies which highlighted that the shortage of qualified SB members lacking appropriate knowledge in Islamic and banking law could potentially have a negative effect on the governance system of Islamic banks and hinder stakeholder trust (see for example; Garas and Pierce 2010; Malik et al. 2011; Garas 2012; Grassa 2013; Ginena 2014). However, the responsibility of giving constructive advice and opinions on religious matters should be given only to the religious scholars who are qualified with religious background. Indeed, issuing a Fatwa is a heavy responsibility and only religious scholars are permitted to deliberate on religious issues. This religious qualification of SB members for these two Islamic banks was highlighted in Table 1 above. Previous research conjectures that the SB is equated to serve as a religious auditor (Briston and El-Ashker 1986; Karim 1990a; Grais and Pellegrini 2006a; Garas and Pierce 2010; Grassa 2013) and a religious scholar (Archer et al. 1998; Safieddine 2009; Hasan 2009; Ullah et al. 2016) in IFIs and its prominent role serves as an additional governance mechanism intended to ensure the prudence of Islamic banking thereby increasing the level of confidence among stakeholders. In fact, the SB plays an essential role in performing the ex-ante religious compliance and ex-post religious compliance task. In the ex-ante religious compliance task, the Islamic bank may seek advice from SBs on religious compliance matters. Meanwhile, in the ex-post religious compliance task, SBs are required to perform their governance functions in directing, monitoring and reviewing the works carried out by management to ensure that all activities comply with the tenets codified in Islamic law. SBs act like a National Fatwa Committee and their functions are to issue Fatwas (i.e., Islamic legal rulings). As such, the membership of SB members is compulsory to comprise of people from Islamic law backgrounds. As members of the SB, we have complete authority to issue a Fatwa and provide religious assurance on the activities of the Islamic bank. The ability to assess the religious issues is instrumental for SBs in performing their roles. Before the bank offers the product to customers, the SB will deliberately discuss and advise on product development pertaining to Islamic principles. Then, they will identify whether the product is highly recommended and permitted by religion or not…. If we look from the SGF guidelines, there are two main responsibilities of SB which include ‘managing’ Zakat and providing advice on issues relating to religious events. The involvement of External Auditors will provide a quality judgment on a true and fair presentation of the financial statements. As such, the above remark gives rise for religious assurance to be issued by only religious scholars. In relation to the development and innovation of Islamic banking product and services, the Islamic banks are required to have the approval and endorsement from the SB before the product is offered to the customer. Hence, the capabilities of the SB in providing good religious advice and opinions could result in improving the soundness of the SB’s governance roles and providing an excellent image of the development of Islamic banking. Another important governance role of SB in providing the religious assurance is religious compliance review functions. The discussion held with the interview participants of both Islamic banks under this study made apparent that the SBs play a pivotal role in directing, monitoring and reviewing all documentation and activities of Islamic banks before the religious assurance is made. As the SB, they are given the ultimate authority to provide a quality religious assurance to the stakeholder that all operations of the respective Islamic bank are in compliance with religious law. Therefore, Islamic banks emphasise competency of SB members in performing these religious compliance review tasks. The religious compliance review roles of the boards—as reported by the interview participants of these two Islamic banks are summarised in Table 2. In identifying the religious non-compliance events (RNC), the SB will delegate their religious compliance review functions to the internal officers. RNC of bank A is just a small fraction; probably around 20%. We review their product manual from time to time after the product has been launched. We will look at their standard operating procedures (SOP), documentations and so on. We hope that the products offered not only follow the common law but also comply with the Islamic principles…. In the stage of product development, the Religious Reviewer and Religious Audit Officers would evaluate and rectify any religious issues on the product manual, the contracts and transactions and the results would then be submitted to the SB for approval. In some cases, the SB will come and review directly the particular department for further investigation. For instance, all the SB members came and reviewed directly the process and transactions carried out by Treasury Department…. We, as a SB, should oversee the overall operations of the Islamic bank. In the product development stage, we are given access to look at the entire process of the product manual. In fact, our SB was very strict because we want to be truly Islamic…. At all times, the SB will not go through the entire process of the operations of the bank. Basically, the internal officer will table the results to the SB. In cases involving religious issues, the SB will request for further clarification and check the documentation…. The SB should oversee the operations of the Islamic bank as a whole. This includes effectively monitoring the implementation of the religious compliance audit and review functions. Based on the above, it appears that often, the religious compliance review function had not been effectively undertaken by SB members of these two Islamic banks as they were overwhelmingly reliant on the findings presented to them by internal officers. This argument is made on the basis that SBs have limited time in assessing the day to day operations of Islamic banks as SB members only work in a part-time capacity. Nevertheless, some of the interview participants were critical about the shortcomings in the role of SB’s when performing the religious compliance review task. This is discussed in the following section. Yes, the SGF covers almost all of the requirements. If we look at the guidelines of GPS-1, it only focused on the functions of the SB. However, the new requirement of SGF clearly spells out the function as well as the role of every single party to ensure religious compliance. The SGF has enhanced the ability of Islamic banks to guarantee religious compliance on the operations and business dealings of particular Islamic banks. In our case, we have become pioneers among other banks in practicing the guidelines laid down in the SGF. The new SGF clearly spells out the requirement for our Islamic bank to recruit new personnel and to establish religious audit and risk functions. Before this, in the GPS-1, the scope of internal officers was only to assist the SB in providing the religious assurance. In a case where Islamic banks were not complying with the requirements stated in the SGF, we also discovered that they were not complying with the IFSA 2013. For our Bank, it is the SGF which would be the framework that enforces us to seriously develop religious audit in ensuring religious compliance. Our interview findings present evidence that SB decisions were made without proper diligence as they were heavily dependent on the recommendations provided by internal officers. In such circumstances, it appears that SB members are observed to be rubber stamping. Such limitation of the SB role would lead to negative impact on the perception of stakeholders and jeopardize the reputation of this alternative banking industry. The reality is that current practice of providing assurance will not be deemed acceptable in the governance framework applied by External Auditors in a conventional setting. Hence, we maintain that SBs should primarily focus on their religious advisory role whilst the religious compliance task and the provision of the religious report are left to external religious auditors. By doing so, the process of religious audit as emphasised in the 2011 SGF could then ensure SB legitimacy in providing attestation for religious compliance (see Najeeb and Ibrahim 2014), since religious audit by its virtue would ensure that Islamic banking operations are conducted according to its objectives, social benefit and religious prudence. This study provides evidence on the governance role of SBs when undertaking the crucial religious compliance review prior to providing assurance that Islamic banking operations are religiously and ethically compatible. In doing so, SBs are responsible to effectively and independently manage their religious compliance task to fulfill the societal legitimacy expected of Islamic banks stakeholders. We, therefore, investigated the current role of SBs using stakeholder and legitimacy theories which imply that Islamic banks shall always uphold ethical and religious compliance as a key operational characteristic to operate business and to demonstrate ultimate accountability to stakeholders. In such instances, this study reveals grave concern about the inherent deficiencies of SB members in performing their task which is attributed to a lack of banking and financial knowledge. More than necessary, the SBs in the two Islamic banks under study were delegating the religious compliance review function to internal officers who then presented their findings to them for approval. Clearly, this practice goes against the grain of both the stakeholder and legitimacy theories as SBs from both the banks participating in our study were found not to have performed their religious governance role diligently. As a result, our view is that there should be clear lines of separation in responsibility of SB’s, with the task of religious compliance be transferred to external religious auditors with the role of the SB to serve purely in an internal religious advisory capacity. Our study also draws some recommendations for the Malaysian regulatory bodies to take a more comprehensive approach to standardising the religious audit process and develop further specific effective religious audit tools as the existing framework only provides general recommendations allowing SBs with flexibility to operate ceremonially rather than fulfill their task diligently. This study also provides insights into the processes of the religious compliance review and the provision of the subsequent religious assurance considering the newly adopted Malaysian 2011 SGF. Previous studies have not investigated this and from that perspective this study adds to existing literature by allowing a greater understanding of the current role and function of SBs and the dynamics of generating the all-important religious assurance designed to convey the expected institutional legitimacy to stakeholders and communicated in the religious compliance report published in banks annual reports. By focusing on the 2011 Malaysian SGF framework, this study allows identification of the current strengths and weaknesses of the Malaysian Islamic banking industry. Our findings suggest that because of the newly implemented SGF, the quality of religious assurance has improved due to the importance placed on religious audit which had contributed to enhancing SB credibility. From this perspective, it appears that the SGF did bring about some of the benefits hoped for by its central bank regulatory architects. Finally, the results presented in this research have implications for other Islamic jurisdictions around the world especially those that are considering emulating a dual-governance central regulatory and governance system like that in Malaysia. This over-arching form of governance practice has its advantages in that a robust and sound governance system can be implemented which would standardize Islamic banking practice. As with other empirical studies, this study also has its caveats. First, not all the key figures in Islamic banks were willing to share their experience with us as they lacked time to entertain requests for interview. Second, this study focused only on the quality of religious assurance from the religious compliance review undertaken by SBs whereas there are other governance mechanisms in Islamic banks like religious audit and religious risk management that may also influence decisions of SBs. Therefore, future studies should be designed to investigate such areas to enable a fuller understanding of the governance process currently practiced not only in Islamic banks in Malaysia but also in other Islamic jurisdictions. In addition, since our study is based on two case studies of full-fledged Islamic banks in Malaysia, we believe that future research should be conducted which could examine important cultural and institutional variables. This should be undertaken either by a comparative or multi-country examination utilising the rich and diverse cultural, religious and institutional differences in the Islamic world as this would provide fertile ground for a future research agenda. For the time being at least, our findings suggest that although our interview participants were generally positive about the impact of the new governance framework, we report some genuine concerns and implications that would merit further regulatory attention. For instance, we recommend that Malaysian regulators need to address urgently some of the key issues identified in this study such as competence, independence and issues on the overall operational effectiveness of SBs to enhance governance practice and to close any expectation gap arising between SBs and Islamic bank constituents. This clearly is an important responsibility for regulators, especially if they desire stakeholders to believe that SBs are working to achieve the expected religious and governance legitimacy. After all, it is now well accepted that the ‘raison d’etre’ and ‘modus operandi’ of SBs is to effectively serve as the conscience of Islamic society. It is worth noting that Malaysia follows the Shafii School of Jurisprudence whilst other Islamic countries in the Middle East and North Africa (MENA) and in South East Asia follow the remaining three Jurisprudential schools. In our view, Levitt’s (2000, p. 5) proposition that Audit Committees should be competent, committed, independent, and tough-minded and should be “one of the most reliable guardians of public interest” also apply to SBs in Islamic Banks. Without SBs, there is no existing mechanism available in Islamic finance that can endorse the ethical, institutional and religious legitimacy expected by stakeholders. Thus, SBs are a powerful mechanism that serves as the conscience of Islamic society. Besides the theories mentioned above, the institutional theory also considers changes in organisational processes over time (Cohen et al. 2002, 2007b) and how governance structures “fulfil ritualistic roles that help legitimise the interactions among the various actors within the corporate governance mosaic” (Cohen et al. 2007b, p. 11). Furthermore, Kalbers and Fogarty (1998, p. 131) argue that “organizational structures…become symbolic displays of conformity and social accountability”. In other words, some governance activities and structures may be driven by a desire to foster legitimacy as in the case of Islamic banks and the intricate workings of SBs. In a conventional setting, several qualitative studies focussing on corporate governance issues opted for case study approach. For instance, Turley and Zaman (2007) used a single case study and interviewed nine individuals. Gendron and Bédard (2006) interviewed three Audit Committee Chairs whilst Spira (1999, 2002) interviewed 21 individuals. In this present study, we believe that the 14 interviews undertaken in the two major institutions are sufficient to provide us with in-depth understanding on how SBs undertook their crucial religious governance roles. By non-religious scholars, we mean those SB members who are not qualified religious scholars per se, but instead, serve on the SB due to their proficiency in law, business, finance or accounting. In Malaysia, unlike elsewhere in the Islamic world, there is a stipulation that in every SB, there must be a member that has a non-religious background (BNM 2011, p. 10).